1966 was a pivotal year for the British beat group The Beatles. It was a year in which they toured the United States, released some of their signature songs including “Got to get you into my life”, “Eleanor Rigby”, “Paperback writer”, and “Yellow submarine, and they were given fashionable Morris Mini Cooper cars by their manager Brian Epstein. 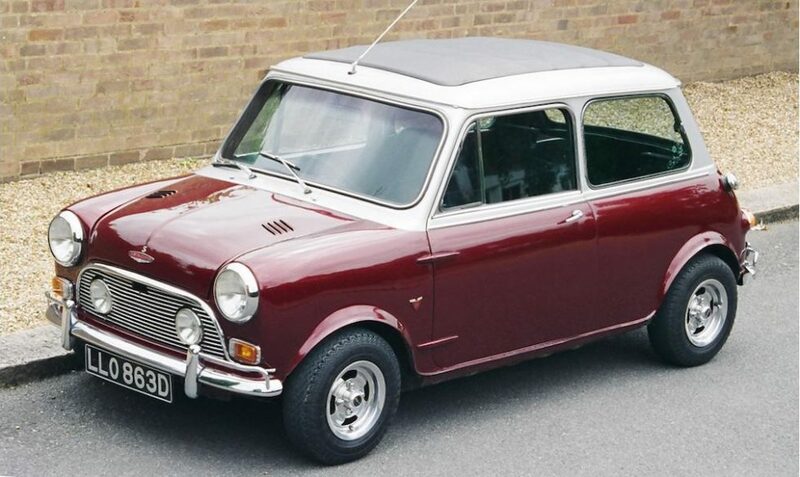 The big question in giving a Morris Mini to drummer Ringo Starr was, of course, how was he going to fit his drum kit into such a tiny car? In buying Morris Mini’s for Britain’s “Fab Four” manager Brian Epstein was confronted with a difficult and potentially expensive problem to solve. A Mini is called a Mini because it’s a very small car, and for drummer Ringo Starr there was no way his drum kit was going to fit into one unless one installed a removable roof. Brian Epstein was provided with a much neater solution by coachbuilder Harold Radford who had begun offering a hatchback modification for the diminutive Mini. Harold Radford were given the job of creating a Mini Cooper for Ringo that he could fit his drums into and the job was neatly done. With the hatchback raised access to the rear is made easy. 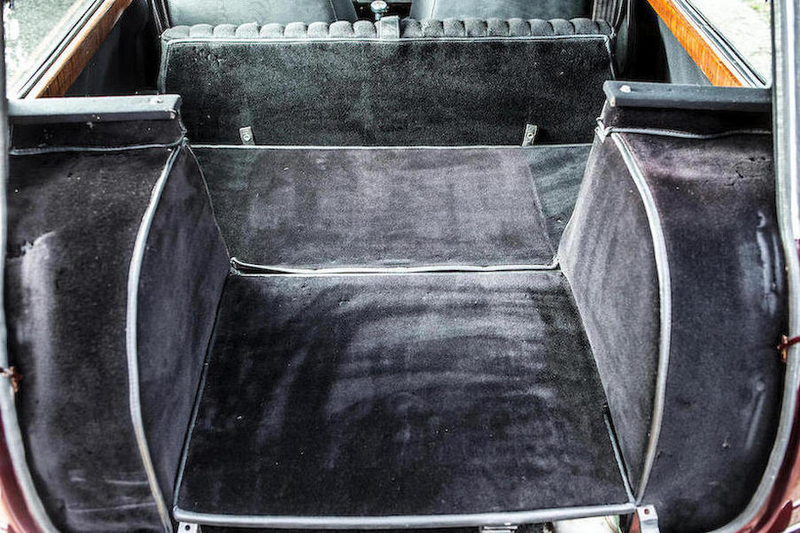 To fit the drum kit in the rear passenger seat would be folded forward. Ringo kept the car for a couple of years and then sold it in 1968. 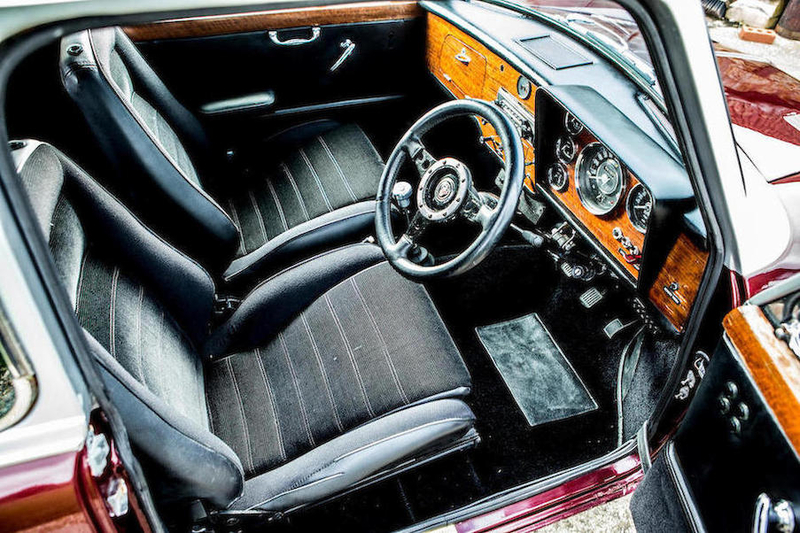 That same year he also sold the Facel Vega he had purchased in 1965 and gave as his reason “I like the security of marriage and the family. 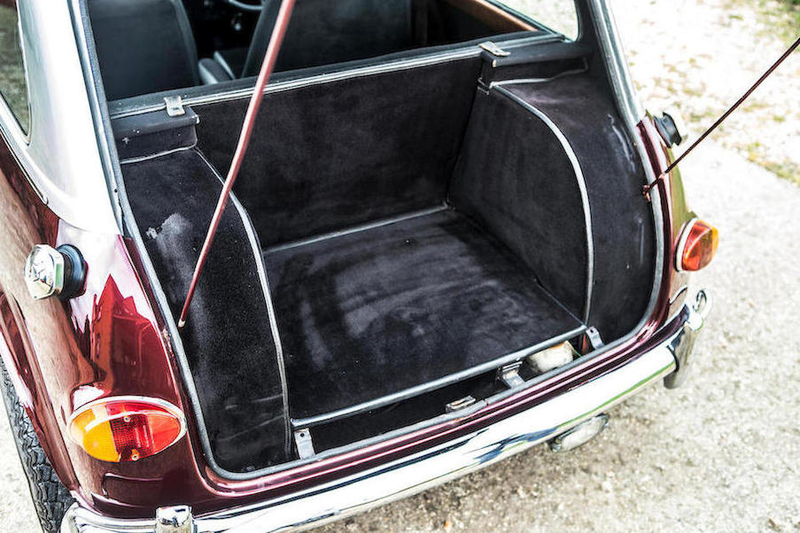 In fact, I’m thinking of selling my Facel Vega and getting an ordinary family saloon, something like a Mercedes.” There was certainly not enough room in the Mini for a drum kit and a family! 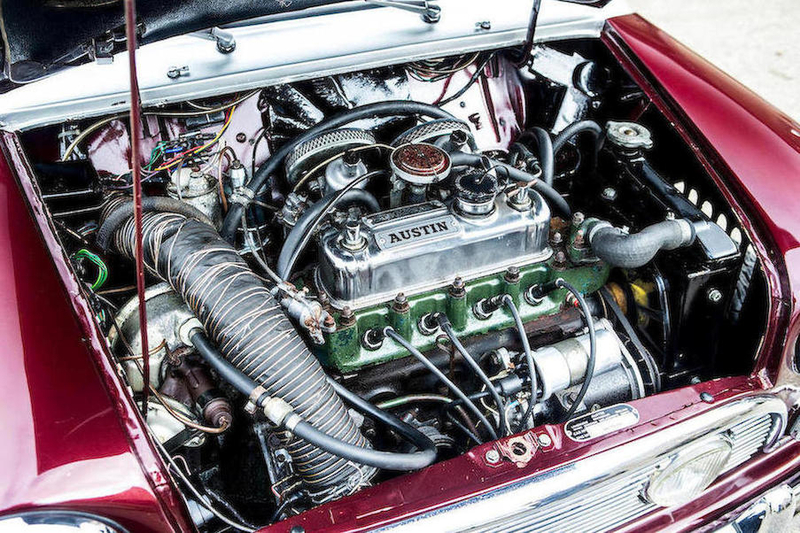 The transverse engine of the Mini was mostly not difficult to work on, although adjusting the SU carburettors involved getting a suitable spanner under them in a rather confined space. The ex-Ringo Starr Mini has a host of desirable optional extras on it: Bonnet vents, Extended wheel-arches, Manx alloy wheels, de-seamed body-shell, Waso fuel filler caps, bespoke window frames and quarter lights, Webasto sunroof, Hooper and Radford badges, triple ancillary gauges, tachometer, cigar lighter, MotoLita steering wheel on Mark II column, internal bonnet release, walnut dashboard and door cappings, folding rear seat, electric windows, etched Sundym glass (side windows), Huntmaster reclining seats, driving lamps (individually switchable), Benolite grille, Morris 1100 indicators, door warning lights, VW ‘Beetle’ rear lights, Cibié headlights in Innocenti rims. It’s a list that reads like a who’s who of desirable car accessories of the sixties. Walnut dashboard and Smith’s gauges: it just doesn’t get much more British than that! This car has appeared on the British TV show Top Gear and won the Cartier ‘Style et Luxe’ concours award at the Goodwood ‘Festival of Speed” in 1998. It is a unique and historic little car. 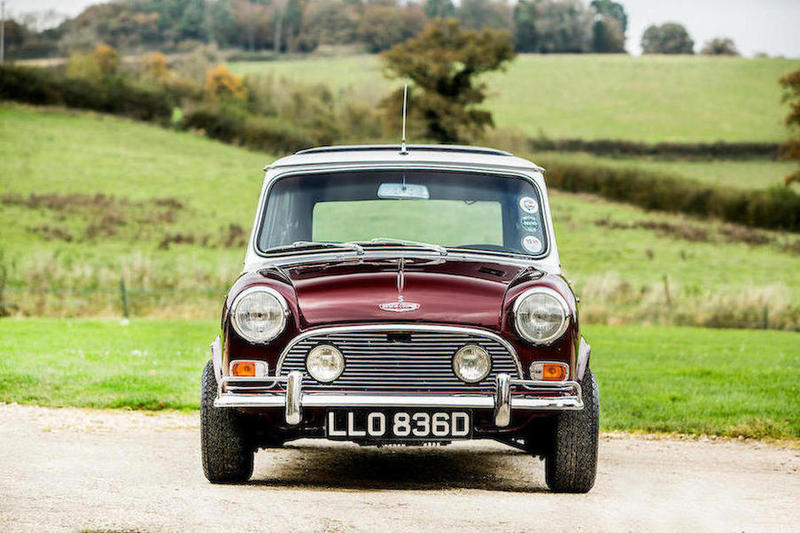 This ex-Ringo Starr Mini Cooper is to be offered for sale by Bonhams at their The Bond Street Sale, in London, on December 2nd, 2017. It is expected to sell in the price range of £90,000 – £120,000. If you are looking for something that is iconically sixties then this little car packs a lot of sixties into a small package.